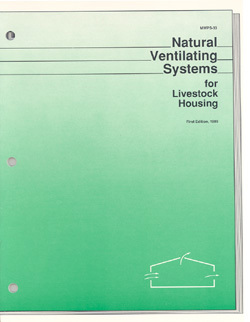 Natural Ventilating Systems for Livestock Housing provides guidelines for applying ventilation basics to achieve naturally ventilated farm and livestock buildings. This handbook provides helpful suggestions for selecting a system based on building type, site, and orientation. Examples of ventilating systems that are unique beef, dairy, horses, and poultry.